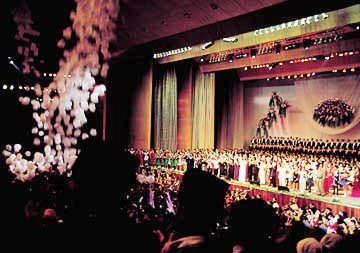 The Inauguration of President Heydar Aliyev at the Republican Palace on the Sunday evening of October 18, 1998, exactly one week after elections had taken place. According to the Constitution, the new President must be sworn in within three days after the tally of the national votes has been announced. It was both a solemn and gala event. The President after being sworn in to office, reiterated the accomplishments of the past five years and set forth his plans for the future. Nearly 1,000 musicians and dancers participated in the lively performances that followed. This marks Aliyev's second term which will continue through October 2003 at which time, according to the Constitution, he will not be eligible to run for a third term. Azerbaijan has no office of Vice President. The second person in command is the Speaker of the Parliament and the third is the Prime Minister. Left: Heydar Aliyev pledging allegiance to Azerbaijan after being sworn in as President for his second five-year term. October 11, 1998 in the Republican Palace. Right: President's Aparat (white building) as seen from 15th century Shirvan Shah Palace in the Old City (Ichari Shahar). This year in addition to the incumbent President Heydar Aliyev (New Azerbaijan Party), five other candidates also ran: Etibar Mammadov (National Independence Party), Nizami Suleymanov (Independent Azerbaijan Party), Firudin Hasanov (Azerbaijan Communist Party), Khanhusein Kazimli (Social Welfare Party) and Ashraf Mehdiyev, an independent candidate (Association of Victims of Political Repression). The final official tallies gave Aliyev (76%), Etibar (11%), Suleymanov (8%), and less than 1 percent each to Hasanov, Kazimli and Mehdiyev. As is true of all incumbent candidates the world over, Heydar Aliyev ran on the record of his accomplishments during his previous five-year term. And by anyone's account, it has been quite impressive. Some thought that Aliyev would be a puppet of the Russians since his experience includes service in the highest levels of Soviet bureaucracy, however Aliyev has been stalwartly independent and has worked tirelessly night and day to secure the independence of his own nation. Aliyev prides himself with having brought stability to this newly established Republic. During the first 20 months of its existence beginning in 1991, the country had three presidents. Aliyev secured the stability and stayed in office his entire full term, 60 months, despite several coup attempts to topple him. 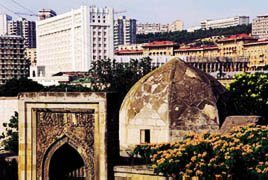 It was during his office that the first Constitution was ratified (November 1995) and a cease-fire went into effect (May 1994), to stop the slaughter of Azerbaijanis and Armenians in the Karabakh war. Since then, Aliyev has led Azerbaijan on the persistent path of trying to realize a political, not military, solution to the conflict. And this, despite his perception of a real lack of commitment on the part of international community to help broker a peace and the ouster of Armenian President Ter-Petrossian who was ready to negotiate a solution. On the economic scene, Aliyev has attracted more than $40 billion of investment for the exploration and development of 16 major oil contracts with international companies representing countries that circle the globe from Japan to Europe, the U.S. and Canada. Most recently, Aliyev has been pushing to secure the route for the major transfer of oil from Azerbaijan and Central Asia via Baku to the Turkish Mediterranean port of Jeyhan (Ceyhan in Turkish). Though international companies have been balking at the idea because of its length and expense, Aliyev insists that this East-West corridor is critical for guaranteeing full independence and for providing a secure oil route for Western countries. Aliyev has been advocating this plan since he met with Turkish officials in October 1994 on his return trip home after addressing the United Nations in New York. This year's Presidential Election, Azerbaijan's fourth since independence, was the first one to take place since the ratification of the Constitution and the passage of laws which regulate election procedures. When the Soviet Union collapsed in 1991, Azerbaijan's Supreme Soviet declared Ayaz Mutallibov, the leader of the Azerbaijan Communist Party as their first President. The procedure carried little legitimacy, and approximately one year later the first direct Presidential election was held. As no laws were in place to define democratic standards, these elections turned out to be mere formalities, and pressure from a growing national movement, organized by the Popular Front forced Mutallibov to leave office. Then the Speaker of Parliament Yagub Mammadov took office and a month later once again tried to re-establish legitimacy in Mutallibov's presidency via a declaration in Parliament. The following day, however, the decision was reversed under pressure from the Popular Front. Mutallibov fled to Moscow and Mammadov resigned. The reins of power passed to the Popular Front. When the second Presidential election was held in July 1992, the chairman of the Popular Front Abulfaz Elchibey was elected. However, representatives of the Popular Front were not prepared for the rapid progression of events, especially those related to the Nagorno-Karabakh war, and very quickly lost their political support. Both Lachin (February 1992) and Shusha (April 1992) had already been captured by Armenian forces. Kalbajar (April 1993) soon fell; Aghdam would be next. Enter Surat Huseynov, an Azerbaijani colonel, who then commandeered his military troops to march against Baku. Nothing deterred him and Elchibey did not wait for the troops to reach the capital. To everyone's surprise, Elchibey suddenly left (the first week of June 1993) to a self-imposed exile in his native village of Kalaki in the Ordubad region, Nakhchivan. 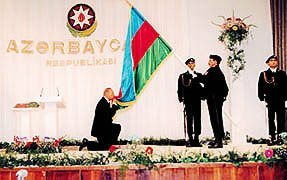 Prior to these events, Elchibey had invited Heydar Aliyev to Baku, hoping that he would be able to take control of the situation and regain the support of people who were protesting the chaos. With Elchibey gone, Aliyev as Speaker of the Parliament took charge of the government and succeeded in restoring calm in the country. In October, elections were held again since Elchibey had not returned, and Aliyev was elected President. In contrast, the 1998 Presidential election was the first time elections were held in accordance with the new Constitution and carried out exactly on schedule, not earlier. Numerous decisions preceded the election including the elimination of the death penalty, adoption of judicial reforms and the abolishment of censorship. Steps were directed to restore civil trust in elections. One of the most obvious features were the television campaigns which took place for the first time. Such a development demonstrates the new stage of social development, the assertion of new ideas and attitudes, and the consolidation of lawfulness. This was also the first time since independence that the government granted permission to opposition parties to hold rallies and demonstrations on the eve of the election at designated locations. Officials in power attempted to achieve a wide consensus in many situations and made concessions to the opposition on a number of points. Nevertheless, some of the opposition leaders proposed that the ratio of representatives on the Central Election Committee should reflect more opposition members. When they did not succeed in getting it changed, they boycotted the election claiming that it would be unfair. Those leaders which chose not to run were Abulfaz Elchibey (Popular Front), Isa Gambar (Musavat Party), Lala Shovkat Hajibeyeva (Liberal Party) and Rasul Guliyev (although Azerbaijan Democratic Party is not officially registered with the Justice Department). Nevertheless, elections were not postponed and approximately 255 foreign observers witnessed them, including the OSCE, European Council, British-Helsinki Human Rights Watch, National Democratic Institute (NDI) and International Republican Institute (IRI), the diplomatic corps in Baku and others. Some of these groups noted voting irregularities and have made their recommendations known to the government. Azerbaijani officials have indicated that they would investigate these situations. Mazahir Panahov and Eldar Azizov are members of the International Relations Department of the Central Election Committee. From Azerbaijan International (6.4) Winter 1998.